Will the ECB start QE this week? As the Eurozone sinks into a deflationary mire and the dreaded Greek elections loom, Mario Draghi finally considers quantitive easing. The European Central Bank (ECB) is to meet in Frankfurt on Thursday, and the odds of quantitative easing (QE) not being on the agenda are about as high as a Lib Dem overall majority in May. In many respects, QE in Europe is already a foregone conclusion. ECB president Mario Draghi's subtle hints that the central bank would start buying bonds have left expectations of QE entrenched in the markets. The Eurozone certainly needs some kind of intervention. It recently slipped into deflation (prices dropped 0.2% in December) on the back of the oil price collapse. Meanwhile, growth remains sluggish and unemployment remains unpleasantly high, at 11.5% in November. This is a nightmare scenario for a central banker, because it renders monetary policy virtually impotent to revive the faltering economy. The question is when Draghi will start pumping money. Euro-judges removed one of the major barriers to QE on Wednesday, by ruling that the Outright Monetary Transactions (OMT) programme, which is similar to QE, is legal. Advocate General Pedro Cruz Villalón of the European Court of Justice considered OMT to be consistent with the remit of the ECB and with EU treaty prohibitions on monetary financing, despite German legal objections. While this certainly makes QE more likely to happen on Thursday, there is still the little matter of the Greek elections. The cradle of democracy is going to the polls on January 25th after its parliament failed to confirm the government's choice of president. Faced with economic catastrophe and crippling austerity measures, widely seen as an unjust and unnecessary German imposition, the Greeks could well elect the left wing Syriza party, which has promised to abandon austerity and default on the country's debt. Clearly, this could pose a major risk to QE in Europe, as the Greek bonds that the ECB would buy (alongside those of other member states) would become worthless. Essentially, the ECB would be flushing some of its reserves down the Mediterranean, which could prove the final straw politically for the anti-QE Germans. 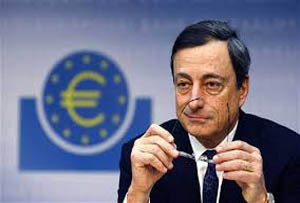 Whether Draghi goes for QE on Thursday or waits for the first meeting after the Greek election on March 5th comes down to how urgently the ECB believes QE is needed. If Europe's woes get any worse, March may be too late. If the ECB waits, it's a sign there was at least some degree of compromise. If it happens Thursday, it's a sign the QE-ers have just trampled on the German monetary hawks. What will happen if QE goes ahead? As far as the markets are concerned, a QE announcement will probably have little impact - it is already expected. Expect a further slide in the Euro if it doesn't. The bigger question is whether it will work, once it is announced. In part, that depends on the amounts involved, which is again a function of how much compromise is taking place behind the ECB doors. The widely expected figure is €500bn (£385bn), but this could be too small, given the vastness of the Eurozone economy. There is also a debate on whether QE actually works at all. It's often used to explain why the US and Britain, both of which have deployed QE, have fared better than the Eurozone, which to date has not. It's hard to say, however, that this is why their fortunes have diverged. Europe has serious structural weaknesses (labour markets and, more generally, the southern countries' economies) that the Anglo-Saxon nations have not. QE should inject liquidity into the financial system and later into the economy at large, but it's uncertain how far this will push Europe out of deflation and into growth. Wider economic forces like oil prices and the slowdown in China could well counteract it. All that is certain is that, serving a 19 nation bloc with hundreds of millions of citizens, Mario Draghi won't please everyone.